Long expected, dynamic contextual retail pricing is now apparently in prototype. 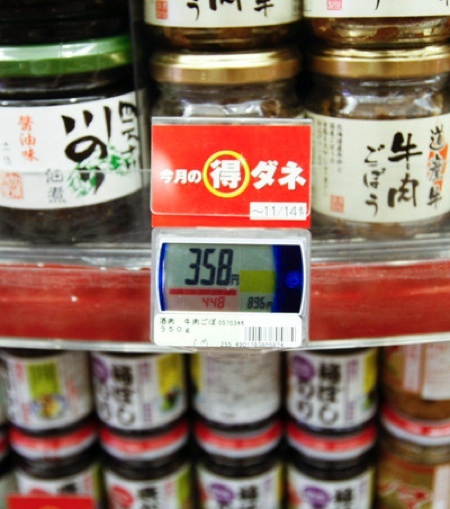 An LED mini-tag displaying the price of an item offers many benefits — to sellers primarily. The price of a can of soup can change depending on the weather, the price of the competition down the street, the amount of stock in the back room, the price of corn futures, or even the pattern of traffic in the store. Quants will have a field day coming up with gonzo algorithms maximizing all these variables. “Get the perfect pickle code!” says the spam to grocery store owners. The optimization inherent in this price display would optimize retail profits first, but eventually, like all the other “zero friction” transactions in the network economy, this dynamic pricing (think eBay) benefits the consumer. However to repeat an earlier prediction of mine: some consumers will head to stores that boast “NO DYNAMIC PRICING!” just as many eBay buyers (I am often one of them) choose to pay the immediate “Buy it Now” fixed price rather than haggle over a fluctuating auction price. Uncertainty has its costs.